Start the long weekend with a night of live music! Baerg-Roeseli: This Brisbane-based Swiss yodel and folkloric group was founded to perform at Expo ’88. Since then it has continued to keep Swiss customs alive through regular performances of folk music and yodelling. Yodelling, a form of wordless singing which constantly alternates between chest and head voice, was first developed by Swiss herders as a means of communication. Baerg-Roeseli performances include yodels, yutzes and instrumental pieces, which are accompanied by homely percussion instruments such as spoons, brooms, washboards and whisks. Innes Campbell is an acoustic guitarist from Scotland who lives in Brisbane. His accurate and driving bluegrass guitar playing (think Doc Watson, Tony Rice, Norman Blake) has won him awards and accolades aplenty, including a national championship on bluegrass guitar in 2009 (Tamworth). Enjoy. 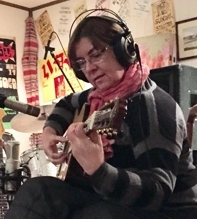 Jumping Fences the song-writing partnership of Lachlan Hurse and Sue Monk join forces with a group of experienced musicians to play their energetic folk, tinged with Cuban flavours. Their original works contain imagery and styles that reveal both an incisive insight into Australian life and a long association with Latin American culture.